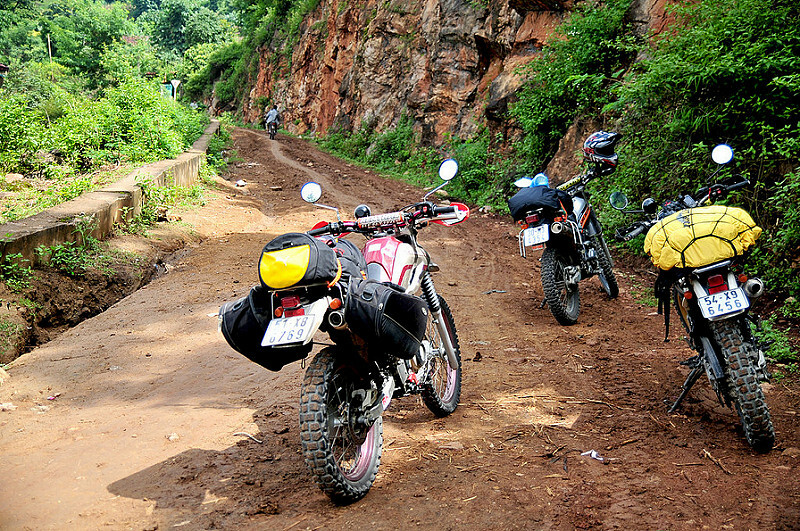 You will ride on all types of roads (from flat and smooth to gravel and bumpy), dirt tracks and jungle paths. Best of all, any road could easily turn into a dirt road when it rains. 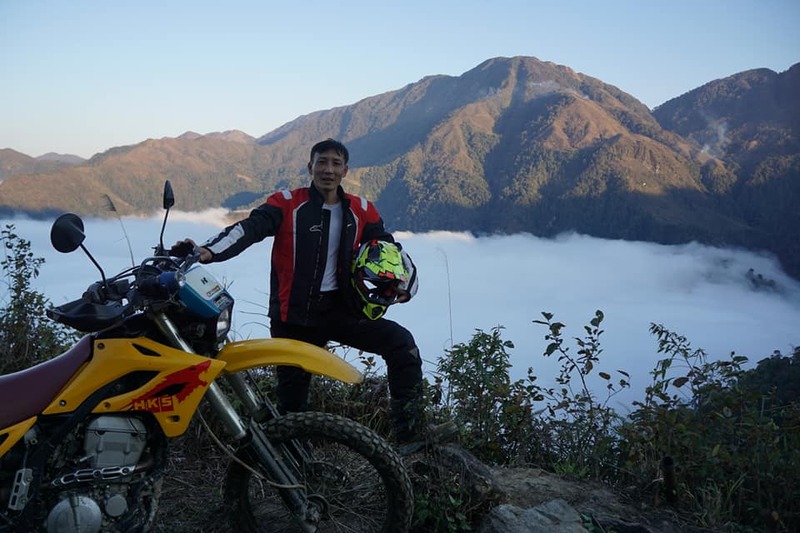 In addition, the spectacular view of cloudy mountains is a great memory from a motorcycle trip beyond of that you can spend extra for trekkingvietnam . On our Ha Giang motorbike tours you skirt along the Vietnam/China border, starting in Hanoi to Nghia Lo, Than Uyen and Sapa in Northwest Vietnam and continue to the most beautiful part of the trip in Ha Giang, Dong Van and Bao Lac before descending on Highway 4 to Cao Bang, Quang Uyen and Lang Son. This is our first day of our 11-day Ha Giang motorbike tours. Before the ride, it takes 30 minutes to double check the bikes and ensure that we have all necessary tools and equipment to guarantee maximum fun. Then we head out of Hanoi skirting along Red River to Son Tay and then head up the mountain to Nghia Lo. The road is easy and flat from Hanoi to Thanh Son, from Thanh Son to Thu Cuc and then Ba Khe to Nghia Lo is beautiful, snaking the foot of Hoang Lien Range. Nghia Lo is a big mountain town where we stop for the night. Wild and bumpy road with Lung Lo Pass as the first challenge. The next one is the higher Khau Pha Pass. We ride through the Mu Cang Chai massif, almost as high as the Fansipan. From the top, it offers one of the most beautiful views of North Vietnam. The ride is challenging but very rewarding. The area of Than Uyen is mainly populated by Flower H’mong and Dzao people. Then direction Sapa. Easy track for 100 km and asphalted mountainous road for the last 40 km. Stay in Sapa and you will find out the reason Sapa is one of the most popular places for tourists in Vietnam. After getting the permit to ride in border areas at Ha Giang’s Immigration Police, we ride on small challenging mountain roads (but incredibly beautiful) on the land of colourful mountain hill-tribes. Head up the Ma Pi Leng Pass. Here is yet another amazing place, with cloudy mountain ranges and the poetic Nho Que river winding off in the distance. Ride on a rig-zag track until Dong Van, a remote area and meet the hard-working local people here. It is inspiring to see how they survive as they manage to live in the rocks. When we reach town we will have some extra time to wander the ancient streets lined with H’mong homes of clay bricks and tiles roofs built centuries ago. We cross the wild regions of the mythical province of Ha Giang. Stop for the night at Bao Lac, the ethnic crossroad of North-east Vietnam. Many other ethnic groups on the two sides of the border meet at the market every Sunday. Beautiful ride down to Cao Bang province. Few passes from where you can dominate the area. The road is easy but there are many blind curves. We can stop very often for photos. Altogether, stop for drinks and food it should be an 8-hour journey. Stay in a hotel. Ride in 1 hour and a half to reach the beautiful village of Quang Uyen, in the middle of a mountain cirque. This is the territory of Nung An people. Home stay with a host family and the hostess is a great cook. We make our way through spectacular scenery to Vietnam’s most impressive waterfall, Ban Gioc Waterfalls, 50km from Quang Uyen. Weather permitting we can swim right up to where the 50m high falls hit the river. An easy day back to Hanoi on the new Highway 1B. You can wake up late in the morning as we guess you can be tired after 10 long riding days. Arrival at Hanoi around 3pm, before rush hours.